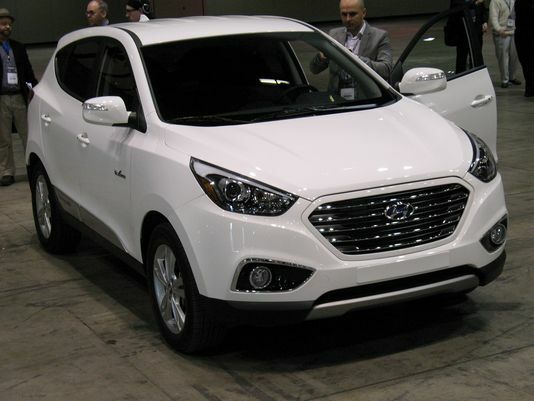 Introduced last year, the Hyundai Tucson Fuel Cell vehicle debuted in the Southern California marketplace. For the first time, retail consumers will be able to put a mass-produced, federally certified hydrogen fuel cell vehicle in their driveways. Availability of the Tucson Fuel Cell will expand to other regions of the country consistent with the accelerating deployment of hydrogen refueling stations. The prime mover for this very special Hyundai crossover is a combination of an electric motor, high-density battery pack and hydrogen fuel cell which emits nothing but water vapor. The Tucson Fuel Cell can only be leased from the manufacturer, but the lease includes unlimited free hydrogen refueling and At Your Service Valet Maintenance at no extra cost. Should a Tucson Fuel Cell require any service, a Hyundai dealer will pick up the vehicle and provide a loaner, then return their vehicle after service to their home or business at no charge. "Hydrogen-powered fuel cell electric vehicles represent the next generation of zero-emission vehicle technology, so we're thrilled to be a leader in offering the mass-produced, federally certified Tucson Fuel Cell to retail customers," said John Krafcik, president and chief executive officer, Hyundai Motor America. "The superior range and fast-fill refueling speed of our Tucson Fuel Cell vehicle contrast with the lower range and slow-charge characteristics of competing battery electric vehicles. We think fuel cell technology will increase the adoption rate of zero-emission vehicles, and we'll all share the environmental benefits." Hyundai introduced its Tucson Fuel Cell to alleviate the limitations of traditional battery electric vehicles. The Tucson Fuel Cell maintains the day-to-day flexibility of the gasoline-powered Tucson so that its driver is able to immediately enjoy the next generation of electric vehicles without range or recharge-time compromises to their lifestyle. The Tucson Fuel Cell represents the next generation of electric vehicles – those that create their own electricity, on-board, from hydrogen. According to UCI's Advanced Power and Energy Program's 2013 study, the hydrogen fuel cell provides lower total well-to-wheel emissions than a battery electric vehicle. For the Tucson Fuel Cell driver, this social benefit is achieved with greater utility, versatility and without compromises. Consider these facts about the Tucson Fuel Cell; a driving range of approximately 265 miles; full hydrogen refueling in under 10 minutes, similar to gasoline; instantaneous electric motor torque; minimal cold-weather effects compared with traditional battery electric vehicles; no moving parts within the power-generating fuel cell stack; more than two million durability test miles on Hyundai's fuel cell fleet since 2000; extensive crash, fire and leak testing successfully completed; quieter EV operation; and zero greenhouse-gas emissions, emitting only water vapor. The benefits of hydrogen are well known -- required supplies for the U.S. market can be produced domestically and its supply is virtually unlimited. It can be produced by varied means – including renewable sources such as biogas. In fact, Hyundai's Fuel Cell prototypes have relied on hydrogen generated at the Orange County Sanitation District near its Fountain Valley headquarters, where methane from sewage is turned into hydrogen. Hydrogen can even be sourced directly from water, using electrolysis to split hydrogen molecules with electricity from renewable sources such as wind and solar. Engine: hydrogen fuel cell – 134 hp at 5,000 rpm and 221 lbs-ft of torque at 1,000 rpm; electric motor – 100 kW; and Li-Polmer battery pack – 24 kW. Copyright. Gary Rome Hyundai. Picture Window theme. Powered by Blogger.